I talked about The Stew & Oyster (AKA ‘Calls Landing’) in my round up of some good places for food and beer in Leeds, but after a fantastic Valentines dinner there last night with the better half I think it deserves a post of its own. Essentially, they’ve upped their game. One of my niggles previously was that the cask beer was often served way too cold. However, this wasn’t a problem last night with my first pint being at perfect cellar temp and in great condition. I opted for a pint of Deuchars IPA to begin with, and at a session strength 3.8%, it was a perfect first beer. Not too heavy, floral, lightly hoppy and bitter in that classically balanced British Bitter kind of way, but with a nice soft underlying malt and slightly creamy mouthfeel. It was a great thirst quencher. The one thing that was a little disappointing was that the three cask ales were very similar; Theakstons Best Bitter (the house ale), Black Sheep Best Bitter, and of course the Deuchars I opted for, all tipping the ABV at a quaffable 3.8%. Whilst all three are perfectly decent session bitters, it meant that by my second drink I was hankering for something with a bit more depth. The recently developed Calls Landing website has a new menu which includes a few well chosen additions such as ‘twice cooked chips’ which I did fancy trying, unfortunately I was told on arrival the new websites menu hasn’t launched yet. No matter, what they do currently offer, they do extremely well and the chalk board stew menu yesterday evening certainly didn’t disappoint. 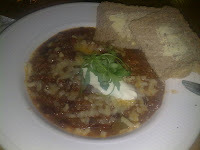 Rich and robust chilli con carne with mixed peppers and smoky bacon. Aparagus with mixed green beans and white wine pesto cream. Rich shepherds stew (beef) with garden peas and broad beans. The website also states “Our stews are homemade using the most seasonal and freshest ingredients. They are all the same price and are served with crusty bread, toasted seeds, cheese, greek yogurt and wild rocket.” Which I couldn’t say better myself. They offer two types of oysters now, both very reasonable and always super fresh. I’ve eaten Oysters in lots of places and the ones from here are as good as any, and for this price, they are untouchable. It’s £7 for half a dozen of the small Irish Oysters but we opted for a full dozen, which came on two separate serving plates bedded with ice and studded with lemon, an attractive and practical way of serving as the ice not only keeps the oysters cool but also ensures they stay upright with all their fresh juice and flavour contained within the shell. For what were billed as ‘small’ oysters they were actually pretty big. With the meat being large for the shell, something which I’ve been told is a good sign, meaning they were very healthy and fresh. Absolutely delicious. 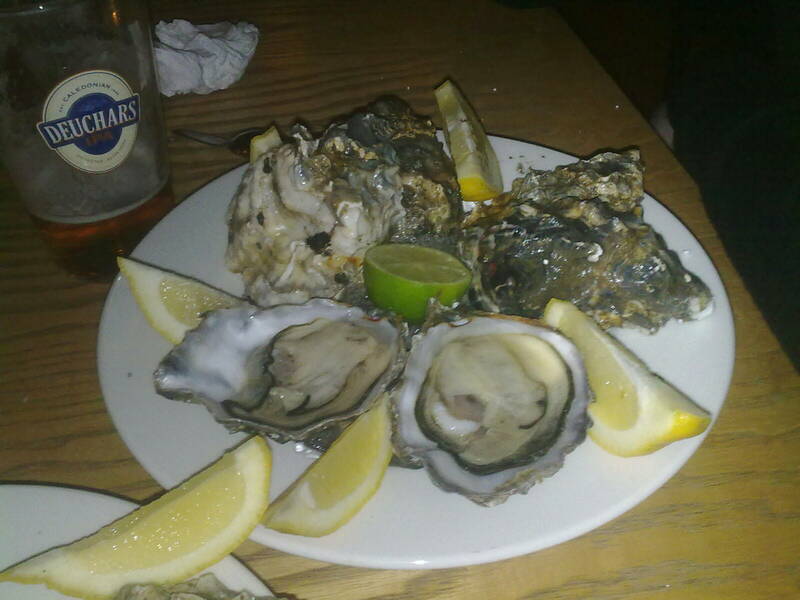 For anyone who hasn’t tried oysters yet, particularly if you are a fan of seafood such as mussels, you are missing out. Just don’t listen to any tosh about swallowing them in one go, it’s a load of rubbish. Chew them and swallow them exactly the same as you would any other seafood to get the full flavour and surprisingly soft, creamy texture. By the time we’d finished the oysters my Deuchars had slipped down nicely, it’s delicate bittersweet flavour matching really well with the salty oysters. I decided I fancied something a bit more complex next and after weighing up the rather samey handpumps, and not fancying a keg lager, opted for a chilled bottle of Duvel from the fridge. A stonewall classic for a reason and always a safe bet. For main course I ordered the Chilli and Colette went for the Shepards stew (both should be £6.50 but with a Taste Card we got them buy one get one free) after being told at the bar it was actually lamb and not the beef that was stated on the board. My stew was really deep and rich with tomato, paprika, chilli, cumin and I think fennel seeds, plus the smoky chunks of bacon lardon, chopped dried red chilli, sweet mixed peppers and long slow cooking really added to the depth of the stew. The meat was really high quality coarsely ground butchers mince and wonderfully ‘beefy’ in flavour. Colette chose the Shepards stew, which if I’m honest I was a little unsure about when I read it on the menu. The description leaning towards a Shepards Pie, but how would that work as a stew? My concerns were unfounded, as it really was fantastic. One of the best stews I’ve tried from here, and something that I can’t believe i’ve never thought of trying myself. It was essentially a deconstructed Shepards Pie with peas and broad beans. The lamb having been slowly cooked with what I think must have been a little wine and stock as well as onions, carrots, garlic, thyme and rosemary, studded with potatoes, peas and broadbeans. It felt like Sunday lunch in a bowl and I half wished I’d opted for it myself. It’s also a really nice touch that the stews come with (on this occasion a measly amount of) rocket, a sprinkling of toasted seeds for texture, and a little greek yoghurt and grated cheese if appropriate (the Sheperds stew didn’t have it but my chilli did). You also get two huge slices of thick cut bread and good room temperature butter. A filling and delicious combo. 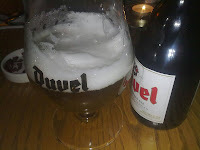 I’m not going to bore you with a description of the Duvel because if you are reading this then you probably know how good it is, but all i’ll say is it actually paired with the chilli really well in the same way that a lager or hoppy IPA would. The other half was drinking Pinot Grigio Rose, and let’s be honest who wants to read about that? In conclusion, if you’re in Leeds then definitely give this place a go. It’s unlike any other place i’ve ever been, and let’s be honest who doesn’t like a good stew and a pint of ale? apologies again for the not-exactly-mouth-watering photos... taken on a camera phone in a busy restaurant!